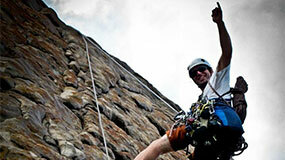 Rock climbing is our real passion at Margaret River Climbing Co. There is nothing we love more than sharing our expert knowledge and experience with our clients. Our rock climbing programmes are designed to challenge and exhilarate you throughout the day. We will teach you an array of skills and techniques that will have you completely amazed with yourself by the end of the session, and will leave you wanting more. YOU CAN DO IT! Our expert staff will always be there to support and coach you during your experience.